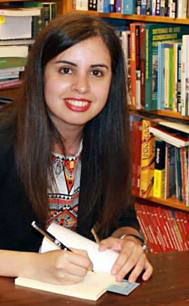 Paola González Sepúlveda is MAEC-AECID (Ministry of Foreign Affairs and Cooperation - Spanish Agency for International Development Cooperation) lecturer in Spanish at the University of Melbourne. Before moving to Australia in 2015, she completed a Bachelor degree in Spanish Language and Literature with Honours at the University of Málaga, spending her 3rd year at the University of Verona and the 4th at the University of Barcelona. She also completed the Postgraduate Certificate in Education (PGCE) at the University of Salamanca, as well as a Master's Degree in Spanish as a Foreign Language at the Menéndez Pelayo International University (UIMP) and the Instituto Cervantes. Other teaching positions and grants by the Spanish Ministry of Education and Culture have taken her to various European countries: she taught Spanish Language and Literature at the Spanish section of the Kodály Zoltán Gimnázium of Pécs in Hungary (2008-2010), in 2012-2013 at the Liceo Miguel de Cervantes (Warsaw, Poland), and at the IB San Paisii Hilendarski (Bulgaria) in 2014. She was also Lecturer at the University of Lisbon (Portugal) from 2010 to 2012, and collaborated in the teaching of Spanish Language and Culture at the international courses of the University of Santiago de Compostela (Spain). In 2013 she received an AUIP (Iberoamerican Association of Postgraduate Universities) grant for research purposes at the University of Costa Rica. She also published a book of poems in 2014 Vestigios de Postumia (ed. Evohé). Her poems appeared in Y lo demás es Silencio (Chiado Editorial 2015), and an anthology of contemporary Spanish poetry, Obituario and La piedra de Sísifo.